Papua New Guinea Accident Investigation Commission (AIC) released the final report of the accident of an Airlines PNG DHC-8-100 (P2-MCJ) 35 km south south east of Madang, PNG in which 28 of the 32 people on board were killed. 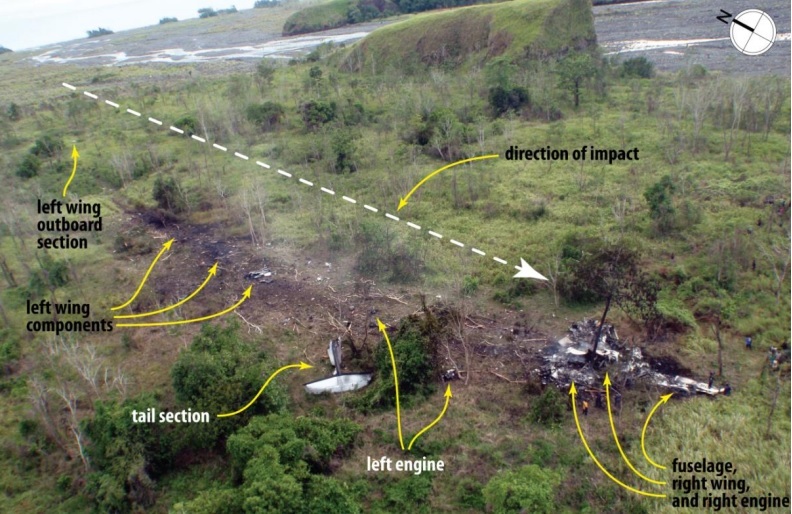 From the evidence available, the following findings are made with respect to the double propeller overspeed 35 km south south east of Madang on 13 October 2011 involving a Bombardier Inc. DHC-8-103 aircraft, registered P2-MCJ. They should not be read as apportioning blame or liability to any organisation or individual.  The Pilot-in-Command moved the power levers rearwards below the flight idle gate shortly after the VMO overspeed warning sounded. This means that the release triggers were lifted during the throttle movement.  The power levers were moved further behind the flight idle gate leading to ground beta operation in flight, loss of propeller speed control, double propeller overspeed, and loss of usable forward thrust, necessitating an off-field landing.  Prior to the VMO overspeed warning, the Pilot-in-Command allowed the rate of descent to increase to 4,200 ft per minute and the airspeed to increase to VMO.  The beta warning horn malfunctioned and did not sound immediately when one or both of the flight idle gate release triggers were lifted. When the beta warning horn did sound, it did so intermittently and only after the double propeller overspeed had commenced. The sound of the beta warning horn was masked by the noise of the propeller overspeeds.  There was an uncommanded feathering of the right propeller after the overspeed commenced due to a malfunction within the propeller control beta backup system during the initial stages of the propeller overspeed.  The right propeller control unit (PCU) fitted to MCJ was last overhauled at an approved overhaul facility which had a quality escape issue involving incorrect application of beta switch reassembly procedures, after a service bulletin modification. The quality escape led to an uncommanded feather incident in an aircraft in the United States due to a beta switch which stuck closed.  Due to the quality escape, numerous PCU‟s were recalled by the overhaul facility for rectification. The right PCU fitted to MCJ was identified as one of the units that may have been affected by the quality escape and would have been subject to recall had it still been in service.  The FDR data indicated that the right PCU fitted to MCJ had an uncommanded feather, most likely due to a beta switch stuck in the closed position, induced by the propeller overspeed. It was not possible to confirm if the overhaul facility quality escape issue contributed to the beta switch sticking closed, because the PCU was destroyed by the post-impact fire.  The landing gear and flaps remained retracted during the off-field landing. This led to a higher landing speed than could have been achieved if the gear and flaps had been extended, and increased the impact forces on the airframe and its occupants.  No DHC-8 emergency procedures or checklists were used by the flight crew after the emergency began.  The left propeller was not feathered by the flight crew after the engine failed. 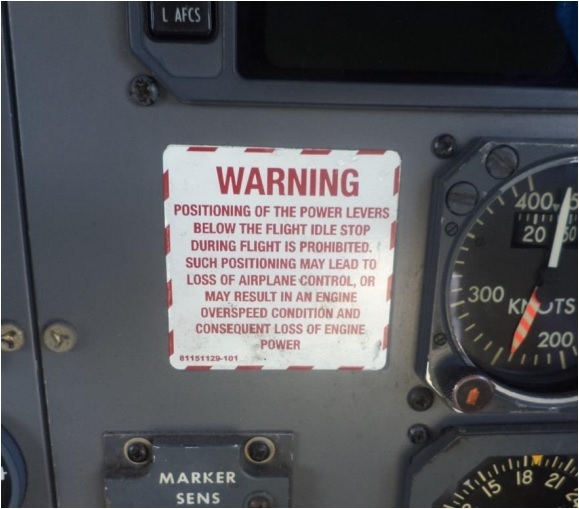  The investigation identified several occurrences where a DHC-8 pilot inadvertently moved one or both power levers behind the flight idle gate in flight, leading to a loss of propeller speed control. Collectively, those events indicated a systemic design issue with the integration of the propeller control system and the aircraft.